Alright. Today there is something I just need to get off my chest. It is something that really grinds my gears, you know? I simply can’t believe that certain doctors and health experts are still peddling what I’m about to tell you as health advice. It makes me mad. So…what am I talking about? I’m talking about the lie that eating egg yolks will increase your cholesterol and risk for heart disease. It is one of the biggest lies some doctors still believe to this day. And yet, some evidence actually suggests that the entire egg benefits your heart. Go figure, right? But, it’s not your fault. It’s not even your doctor’s fault. See, you just eat egg whites because you were told to. But, I’m here to set the record straight. It is true that eggs are high in cholesterol. In fact, one medium-sized egg contains about 62% of the recommended daily intake of cholesterol. However, according to scientific research, eating cholesterol might not increase your blood cholesterol levels at all. Most people think of cholesterol as a negative word that is linked with heart disease, stroke, and possibly heart attacks. The truth is that cholesterol plays a crucial role for the health of the body. And without it, you and I wouldn’t even exist. Basically, good ol’ cholesterol is part of every single cell membrane. And it is used to make steroid hormones in the body like cortisol, estrogen, and testosterone. Given how important cholesterol is, the body always makes sure there’s enough. Since getting cholesterol from the diet isn’t always possible, the liver will produce cholesterol to compensate. However, when we do eat lots of cholesterol-rich foods like eggs, the liver will simply produce less. Our body is one incredible, fine-tuned machine, isn’t it? So, really, the total cholesterol in the body changes very little, if at all, when you get cholesterol from the diet rather than the liver. How Often Should You Eat the Whole Egg? When it comes to eggs, some have recommended a maximum of two to six egg yolks every week. That being said, there really isn’t much to support that bit of advice. Actually, multiple studies suggest that eating one to three whole eggs per day will, in fact, increase the HDL (high-density lipoprotein), or “good” cholesterol. While most of the time, the total cholesterol and LDL (low-density lipoprotein), or “bad” cholesterol, won’t change at all. At the same time, eating eggs enriched with omega-3 could lower blood triglycerides—another heart disease risk factor. Studies, such as a 2013 meta-analysis of eight research articles published in the BMJ, have even indicated that high egg consumption is not associated with increased risk of stroke or coronary heart disease. On the other hand, having low cholesterol has been linked with dementia, Alzheimer’s disease, depression, suicide, and more. Low total cholesterol, formerly thought to be protective against heart disease, is even associated with a higher risk of death in women. And, let’s not forget that egg yolks are more than just high in cholesterol. From a nutritional standpoint, it just doesn’t add up why you would ignore the yolk. The egg yolk reigns supreme over the egg white in nearly every category. The egg white contains more protein, and that’s basically it. But the yolk, in addition to the cholesterol, contains almost as much protein, as well as higher amounts of phosphorus, zinc, folate, vitamin A, vitamin D, choline, vitamin B12, and antioxidants like lutein and zeaxanthin. Biotin is also found in the egg yolks, and not the whites. 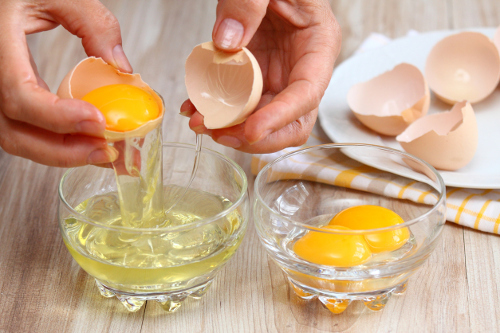 When you discard the yolks, the egg whites may actually deplete the effects of B vitamins and possibly cause biotin deficiency. All yolks aside, the type of egg you consume does matter a lot, too. I purchase pasture-raised, organic eggs from my local farmer. These come from chickens that haven’t been given arsenic, antibiotics, or growth hormones. Organic hens are also fed certified organic grain that is non-GMO, or not genetically modified. If you get your eggs from your local farmer’s market, chat with the farmer about how their chickens are raised and whether they have true access to the outdoors. I’ll finish with this: The nutritional profile of pastured-raised, organic eggs is just too impressive to ignore. And, not only do eggs NOT increase cholesterol, but they also benefit HDL cholesterol. Alternately, having cholesterol that is too low can lead to a cluster of health problems. In summary, eat the whole egg, even the yolk! Kritchevsky, S.B., et al., “A Review of Scientific Research and Recommendations Regarding Eggs,” Journal of the American College of Nutrition, June 30, 2004, 23, doi: 10.1080/07315724.2004.10719429, last accessed June 20, 2017. Blesso, C.N., et al., “Whole egg consumption improves lipoprotein profiles and insulin sensitivity to a greater extent than yolk-free egg substitute in individuals with metabolic syndrome,” Metabolism, March 2013; 62(3): 400-410, doi: 10.1016/j.metabol.2012.08.014, last accessed June 20, 2017. Njike, V., et al., “Daily egg consumption in hyperlipidemic adults – Effects on endothelial function and cardiovascular risk,” Nutrition Journal, July 2, 2010; 9: 28, doi: 10.1186/1475-2891-9-28, last accessed June 20, 2017. Bovet, P., et al., “Decrease in blood triglycerides associated with the consumption of eggs of hens fed with food supplemented with fish oil,” May 2007; 17(4): 280-287. https://www.ncbi.nlm.nih.gov/pubmed/17134951, last accessed June 20, 2017. Oaklander, M., “Health Food Face-Off,” Prevention;https://www.prevention.com/food-nutrition/healthy-eating/a20442212/egg-nutrition-versus-egg-whites/, last accessed June 20, 2017. Le Vere, A., et al., “In Defense of Coconut Oil: Rebuttal to USA Today,” GreenMedinfo, June 20, 2017; http://www.greenmedinfo.com/blog/defense-coconut-oil-rebuttal-usa-today, last accessed June 20, 2017. Rong, Y., et al., “Egg consumption and risk of coronary heart disease and stroke: dose-response meta-analysis of prospective cohort studies,” The BMJ, 2013; 346: e8539, doi: 10.1136/bmj.e8539, last accessed June 20, 2017. “Egg, white, raw, fresh, Nutrition Facts and Calories,” SELFNutritionData; http://nutritiondata.self.com/facts/dairy-and-egg-products/112/2, last accessed June 20, 2017. “Egg yolk, raw, fresh, Nutrition Fact and Calories,” SELFNutritionData; http://nutritiondata.self.com/facts/dairy-and-egg-products/113/2, last accessed June 20, 2017.